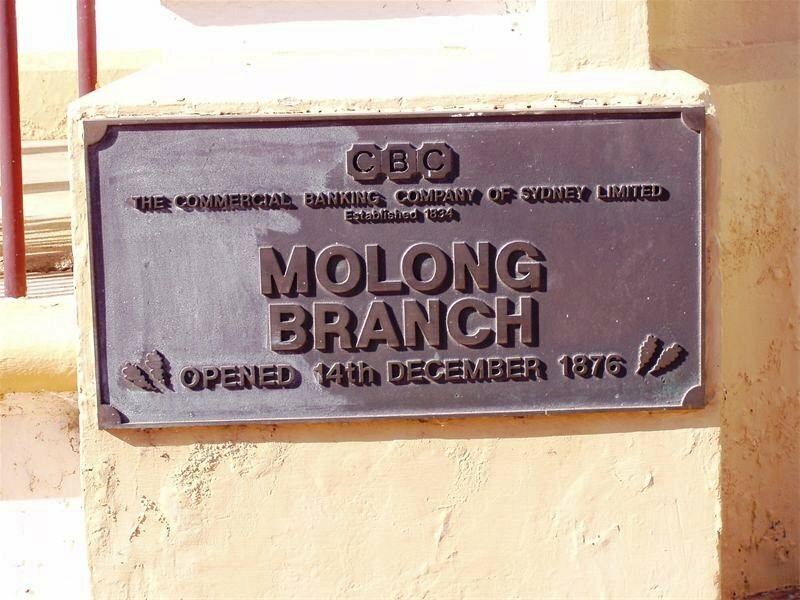 2010 Molong is 97 km from Dubbo. 1876 Opened (57th Report); Plaque photo states Branch opened 14th December 1876. 2005 October photo by John Ness. Offers Invited via Ray White real estate, Orange. 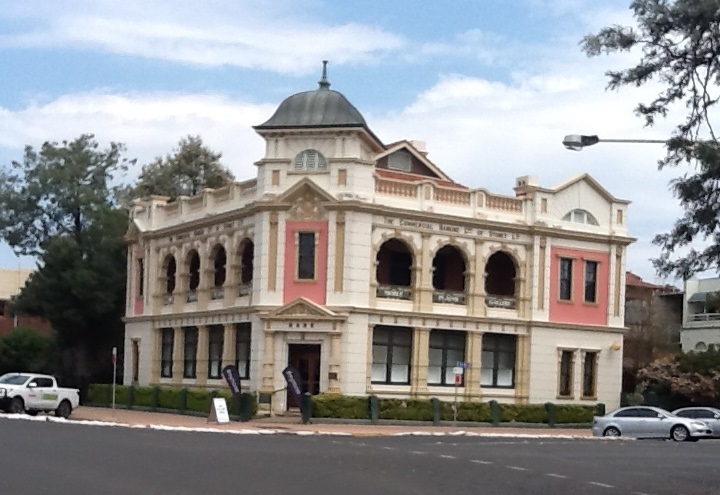 This gorgeous building was the old NAB in Molong. An excellent location with limitless opportunity. 2010 April photo submitted by Jim Bryan. 2008 Mooball is on the old Pacific Highway 18Km south of Murwillumbah. 2008 Ian Holston advises that Mooball agency was conducted at Kelly's Store near the Victory Hotel. Site is now occupied by a gift shop. Ian spoke to Leo Kelly in August re Mooball and he said the Agency was conducted in a small secure area on the Left Hand Side of the Store. He is very pleased that the old store has now become a very successful craft shop and gathering spot for ladies all around the district and beyond. 2008 photos by Ron Armstrong, one is an amalgamation of left & right sides. 1908 Premises completely destroyed by fire in November. 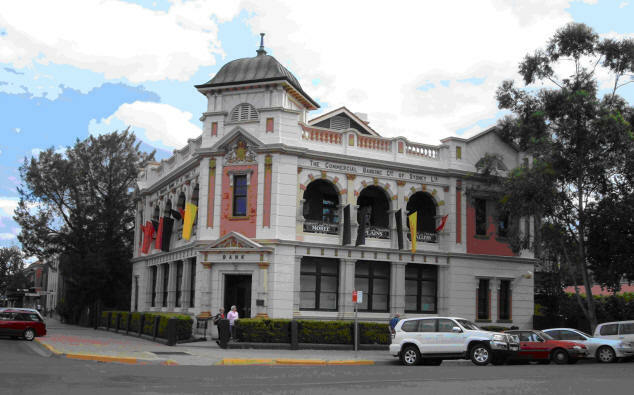 1910 Notable architect P. E. Ranclaud designed the building, a bank and manager's residence, which was completed in 1910 and became one of the most important historic buildings in Moree. 1934 Listed and pictured in Century of Banking as a typical branch. 1968 Aerial photo from Current Accounts January. 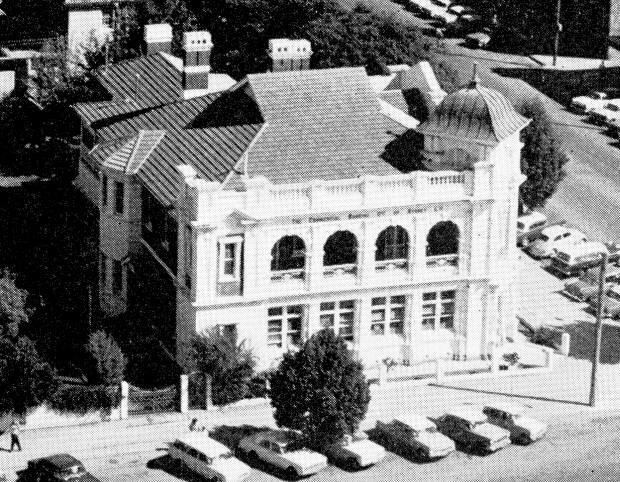 1988 November the Gallery was officially opened by then Premier Nick Greiner, MP. 1988 colour photo by Kevin Nicol, who notes: "The old C.B.C. building where I worked for two and a half years, fifty years ago, is now in 2005 an arts and cultural centre. The office section and part of the upstairs residence has been beautifully restored and well worth a visit should you be out that way." Description: A two storey rendered brick building originally a bank and residence. The design by architects, Ranclaud and Thomas, is Federation Free style with Baroque exuberance. 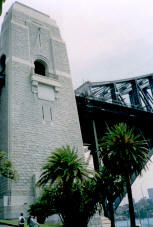 Five bays to Frome Street and four bays to Heber Street and central truncated tower/entrance feature with ogee profile roof and finial. Elaborate rendered features including arches, pilasters, cornices and balustraded parapet. Residence is surrounded by two storey timber shingle and cast iron verandah with lattice valance. 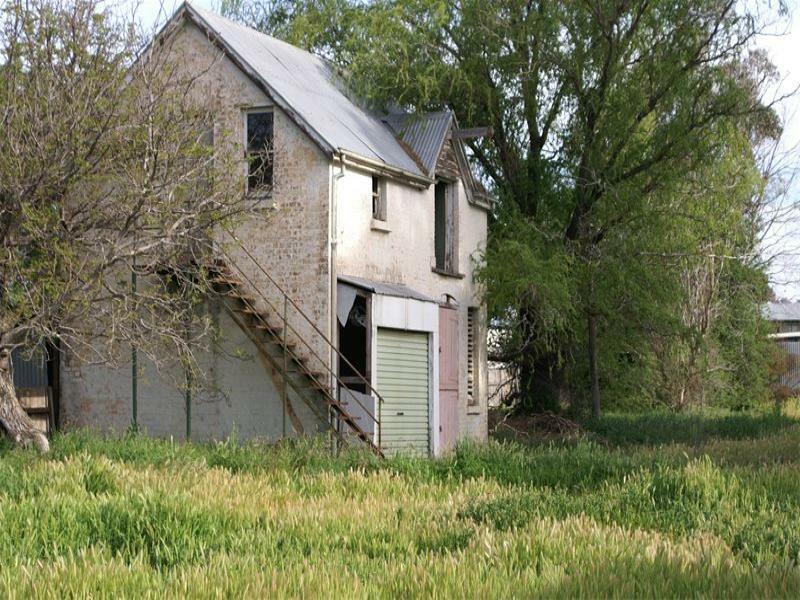 The building is intact and is positioned on a large allotment in the central business district being located in proximity to several other buildings which have heritage credentials each being listed by the National Trust of Australia and Heritage Council of New South Wales. The lot is developed with several large trees: silky oak and jacarandas. As part of the bicentennial a brick single storey building and pergola was constructed at the rear of the lot. The building is to be used as a gallery workshop using an architectural design to blend with the above mentioned structure. 2009 January John Munro reports: "Thought you might appreciate this. It was made by our No 2 son , Grant, for us for Christmas 2008. 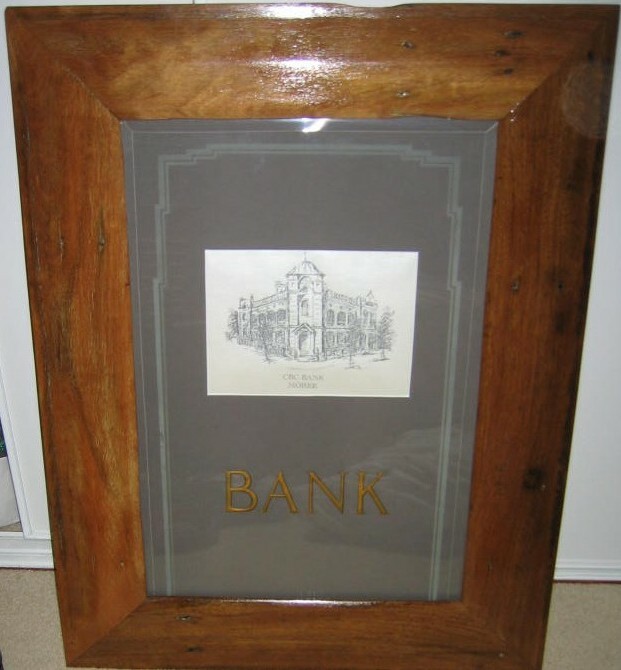 The etched "BANK" Glass is from the old Moree Branch Glass Front Door Panels. When the building was acquired by Moree Plains Council to become the Moree Plains Regional Gallery the Gallery removed these door panels and I bought them with a view to using them somewhere in our home. That did not happen and when we sold our Moree home to son Grant the panels were still in the garage. Grant subsequently sold and moved to Laidley Qld and the panels went with him. The drawing of the building is one done by my wife, Glad, and Grant obtained a copy of it and, unbeknownst to us, made the frame and used a cut down portion of one of the panels. It will now take pride of place on a wall in our Toowoomba home. Browsing through some of my other CBC memorabilia I have come across the publication "A Century of Banking" put out for the CBC Centenary in 1934. I found this book at Moree and inside the front cover is written details of the 1926-1936 Manager at Moree, Alan McConaghy" See Family Connections for more on McConaghy. 2009 August 29 photo (c) Leigh Wright on Flickr. 2017 September photos by Wayne Linnert of old Moree branch now an art gallery. 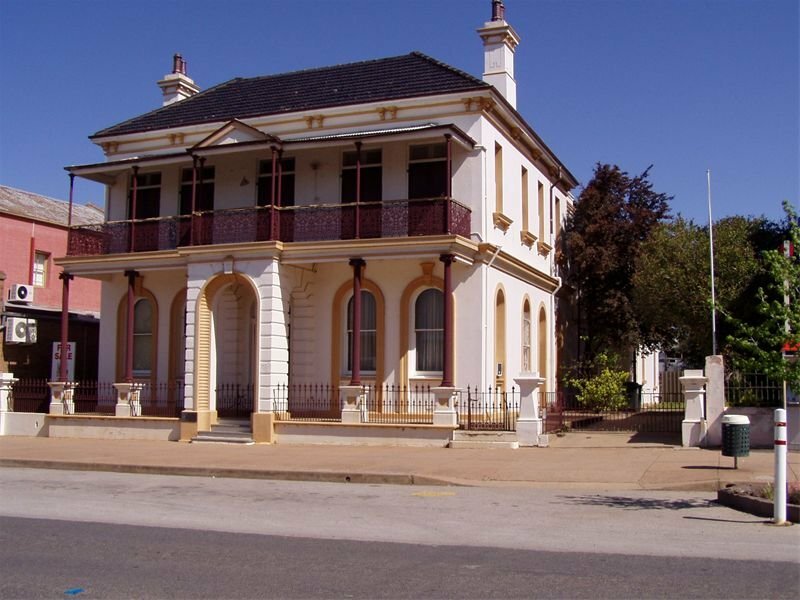 2009 Heritage Listed residence: Historic: Records former importance of Morpeth as major port town and commercial nature of Swan Street. Aesthetic: Impressive scale and bulk of former bank stands out against low scale single and two storey residential development of town. Typical detailing of Italianate style in porch arched opening and arched windows. Important to townscape generally and special character of Swan Street as the main street. Style: Victorian Italianate. Exterior: Rendered Masonry. 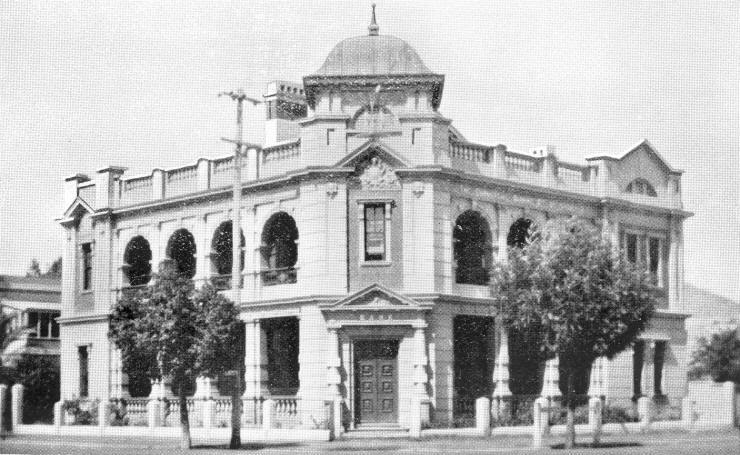 Characteristic of CBC Branch Italianate bank design, two storey symmetrical layout, cast iron posts to verandahs on three sides. Masonry arched portico, arched windows. Cast iron columns "W.R Wise Newton Road, Sydney". Impressive scale and bulk of former bank stands out against low scale single and two storey residential development of town. Typical detailing of Italianate style in porch arched opening and arched windows. Important to townscape generally and special character of Swan Street as the main street. Just beyond the terraces is the rather elaborate CBC Bank building (1889). Designed by the Mansfield brothers it has a particularly impressive interior, featuring Italian fireplaces, porcelain servants' bells, red cedar woodwork, a fine staircase, quality panelling and original bank fittings including a huge cedar counter, ledger desk and cupboard. Other elements are the old vault, an underground well, a roof tank installed to improve water pressure and, at the rear of the building, the sandstock coach house, stables and loft. The exterior has a grandiose arched entranceway and arched windows. It is currently undergoing painstaking restoration and will reopen as a guesthouse. 1880 June 30 Report lists Waddy R. as manager. 1883 December 31 Report lists Waddy R. as manager. 1890 June 30 Report lists Waddy R. as manager. 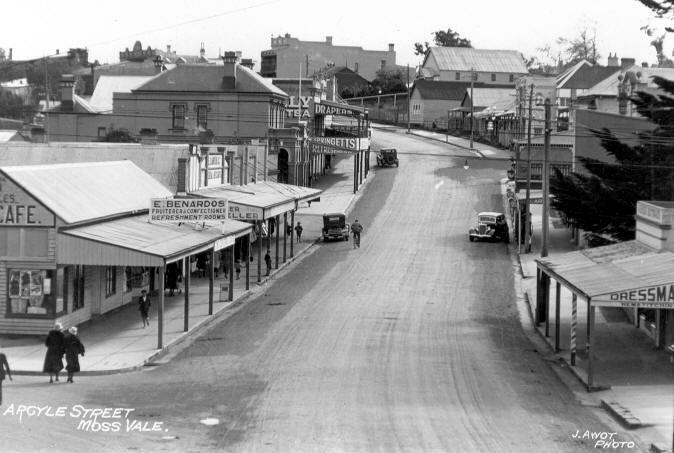 1944 City of Maitland was formed from the three districts of private town Morpeth, government town East Maitland and peoples town West Maitland. 2009 December Google image sourced by John Beer. 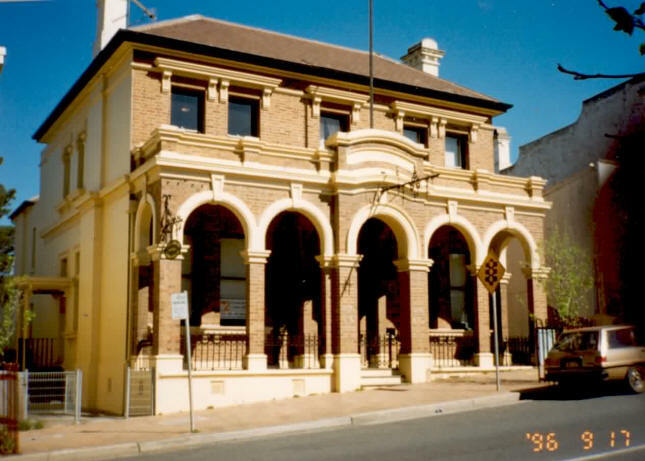 Historically the building represents the early 20th century establishment phase of the Commercial Banking Company of Sydney in Moruya and as such the building has local significance. Aesthetically although adjacent shops of the period are of similar style, the Bank building is rare of type locally and has local aesethetic significance. Socially it is significant for evidencing a turn of the century business deal involving an eminent local business family and as such has local social significance. Scientifically the Bank has the potential to reveal information about the form and scale of rural centre Bank buildings required of the Commercial Banking Company of Sydney. For this reason it has local scientific significance. Victorian Italianate. Rendered brick external walls. Corrugated galvanised iron roof. Cement friezes to top of parapet. Large fixed glass, timber framed windows. Vulcan St Pharmacy signage. 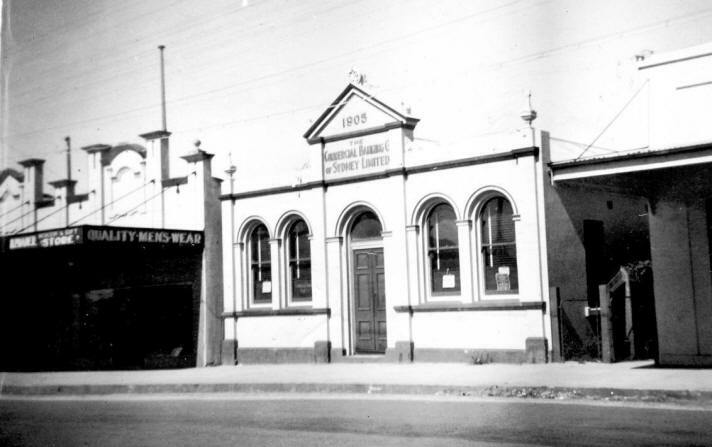 In 1884 Mr Walker, manager of the Commercial Banking Company, Bega came to open a branch of the bank in Moruya, choosing the premises of Mr Morris in Queen Street, adjoining the office of Mr Toose, solicitor, near where the district library now stands. Mr Walker stayed to establish the new branch, and with the help of Mr Osborne, business commenced on 21 May 1884. In October 1905, for £70 per annum the Commercial Banking Company leased presmies at 60 Vulcan Street from Mr John Emmott who had built the distinguished looking building in 1890 with the bank in mind. The assistant occupied the one bedroom in the building. 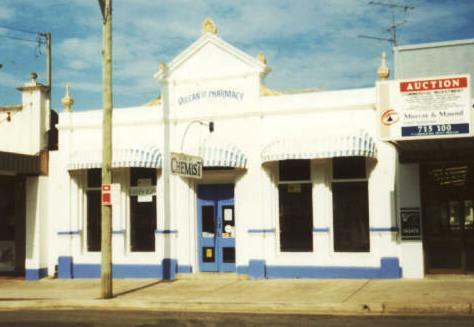 It has been used for many different things over the years, such as the CWA meeting hall, Vulcan Street Pharmacy though it is now used as George Tait Chemist. Early in 1906 two posts with rings were placed outside the bank for the purpose of securing horses belonging to customers. Mr E A H Shepherd purchased the building from Mr Emmott, then sold it to the Commercial Banking Company in 1928 for £1140. In 1950 the bank bought a new site opposite the existing premises for the construction of a new bank and residence. 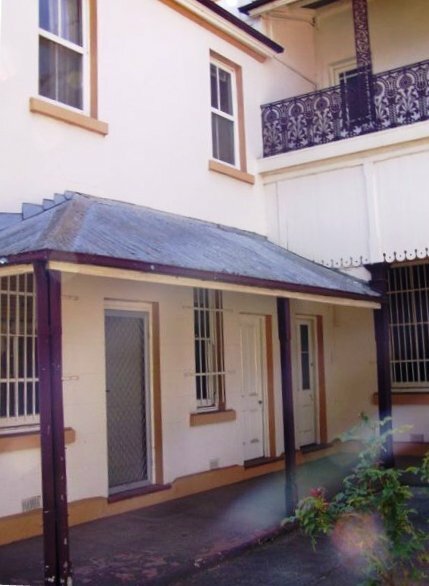 For £1000 it obtained the southern garden of the Bank of New South Wales on which William R Laurie and Eric F Heath of Barrack Street Sydney, built the branch bank, manager's residence and garage, sundry fencing, paths and septic tank for 28000. 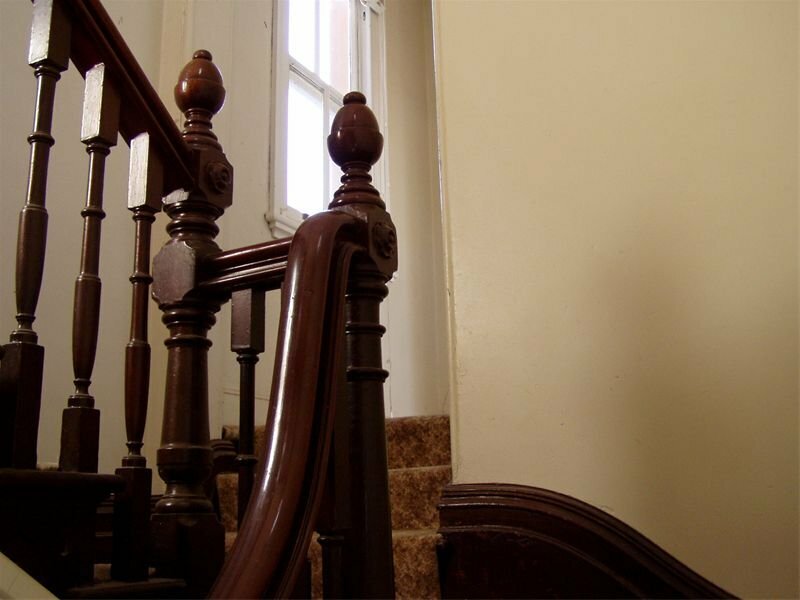 The interior of the house is of pine timber and the picture rails, headings, skirtings, staircase, bank fittings and partitions are of Queensland Maple. Mr Osborne (1884); Mr Bloomfield (1887); G R McKenzie (1889); H J Fenwicke (1894); W H Haxby (1898); R Somerset (1913); L E I Finch (1923); E J G Tynan (1931); C H Thompson (1932); L J Dale (1935); F L Pederson (1937); D J Mackay (1952); N F Pitt (1956); R G Tandy (1967); E C Body (1972); D Durkin (1977); and, H Wood (1982). 1885 Designed by Mansfield Bros Built by Gee & Lusted. 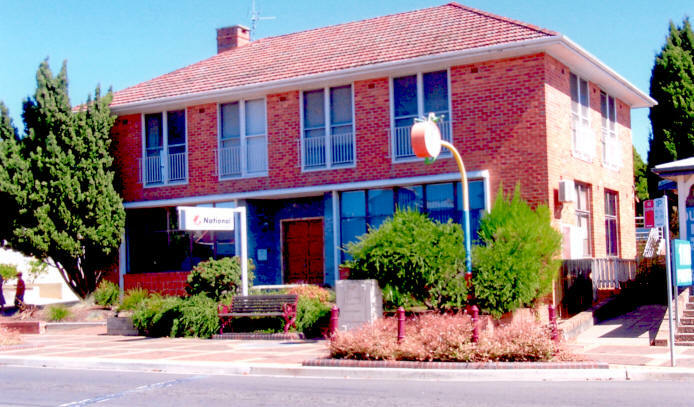 The former bank building is significant in the pattern of commercial development in Moss Vale. It is important in representing the growth of the town centre following the advent of the railway. The building is also significant in possessing a high degree of creative accomplishment in relation to its design compared to other commercial buildings in Moss Vale and the region. It is a good example of the work of a highly regarded firm of bank architects. 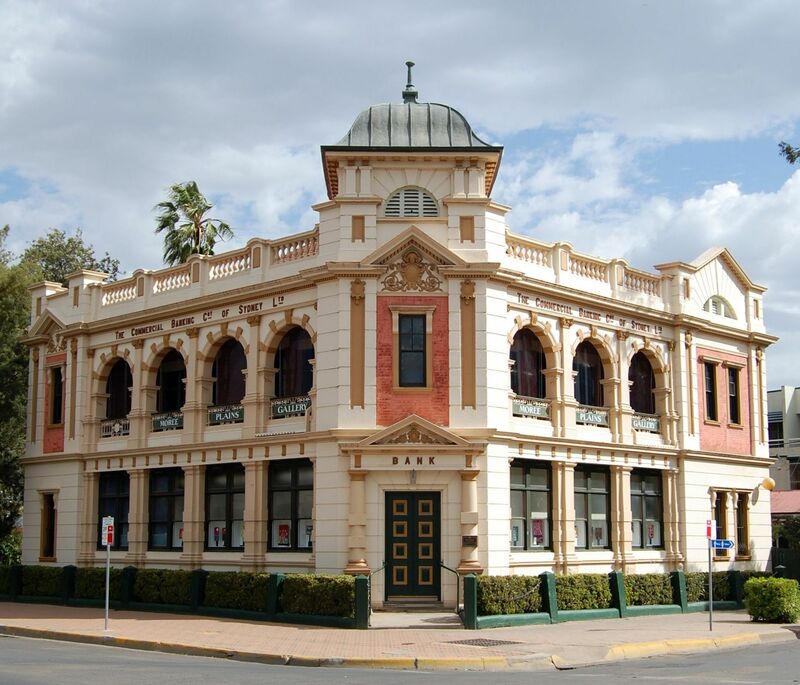 One of many former CBC banks designed by the Mansfields and built in country towns in the last part of the 19th century, it is also a good representative example of this type of bank architecture in the region. The fact that it is little altered and retains the associated outbuildings is important in understanding the function of the bank as an office and manager's residence. 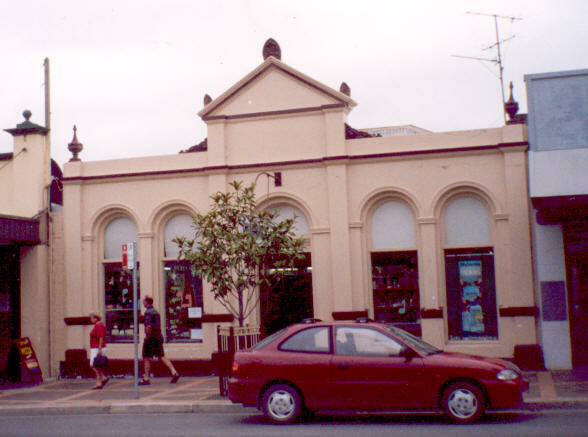 An attractive two storey late Victorian commercial building with Victorian Italianate inspired features and detailing on the front facade of what is essentially a simple Victorian Georgian/Regency structure. The symmetrical face brickwork front facade is decorated with renderwork mouldings - projecting shelves & console brackets to heads of the first floor windows & deep parapet & string course mouldings around the edge of the ground floor colonnade. The half round arches to the colonnade also have rendered mouldings and ornamental "keys". The colonnade is supported on slender brick columns with rendered "capitals" and in the centre has a break front surmounted by a shallow curved pediment with a recessed panel below. A low iron balustrade lines the edge of the colonnade. Windows are double hung sashes, those to the ground floor featuring elaborate rendered sills on console supports. Side walls are rendered with some renderwork decoration around doors and windows on the east wall. The rear elevation is of painted brickwork with a two storey, timber framed verandah (with a hipped corrugated iron ). Single and double storied wings have been added (both in rendered brick) the larger wing probably being roughly contemporary with the main building. The hipped slate roofs appear to be in quite good condition (and suitably aged) as do the 3 rendered brick chimneys with decorative projecting renderwork mouldings. A brick store room/coach house with a slate roof is situated to the rear of the bank building. 1996 by Frank Chapman and b&w streetscape with CBC on left hand rise supplied by Mr Chapman also. Cropped enlargement also. Mount George (receiving office of Wingham) Mount George is 18Km west of Wingham. mentioned in Current Accounts July 1959. 145Km west of Condoblin. Branch opened in 1883 and closed in 1885 (Current Accounts July 1968).